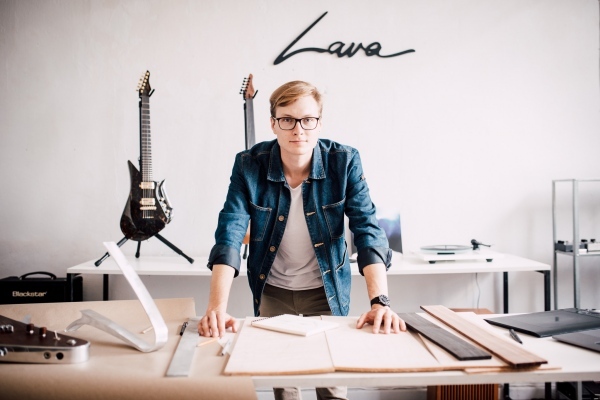 Rapolas Grazys is Lithuanian product/industrial designer. Fields of creativity: High-End audio, music instruments, conceptual and interactive installations, identity and branding. At the moment specialising in sound and design interdisciplinarity. Specialising in one of a kind product creation. R.Grazys established a trademark called LAVA DROPS which connects sound and design collaboration and creates exclusive one of a kind functional musical art pieces to enlarge musical playability and creativity. Lava Drops is appreciated by the famous world wide musicians: Jack White (White Stripes), Steve Morse (Deep Purple), Dominic Miller (Sting), Tommy Emmanuel etc. R.Grazys works where presented in: USA, United Arab Emirates, United Kingdom, Sweden, France, Germany, India, Denmark etc. Publication in world class magazines: Designboom, The ICON, A&B, RollingStone, PremierGuitar, GuitarPlayer, IguitarMag, Gizmodo, GuitarFair etc. R.Grazys graduated from "Vilnius Academy of Arts” of BA and MA industrial design studies. Studied "Danish Royal Academy of fine Arts".